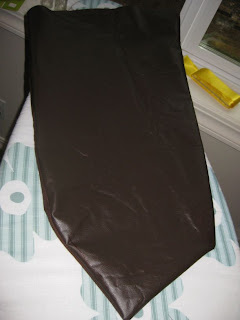 I haven't had much time to work on this costume over the last week, but I did get a few things done. 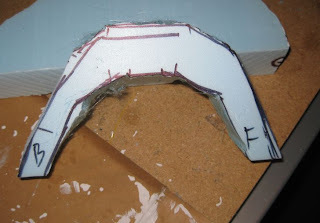 I formed the base of the shin guard from Model Magic and foam board. The bodice/tabard piece is off to a good start. 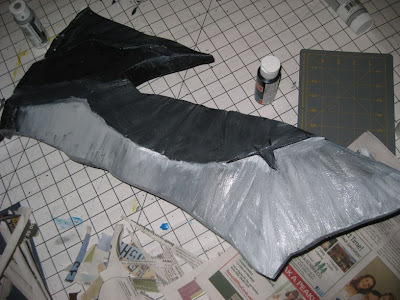 I paper-mache'd the shin guard with strips of newspaper and Mod Podge to give it a uniform texture, then spray-painted it black. That's how far I got prior to tonight. I spent about 2 hours working on everything tonight (Wednesday). 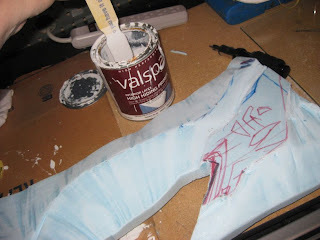 First I hotglued the spikes to the shin guard (in some pictures - the Chinese art? - she has spikes on the knee, in others I can't see them, but I figured the spikes were cool so I would add them). 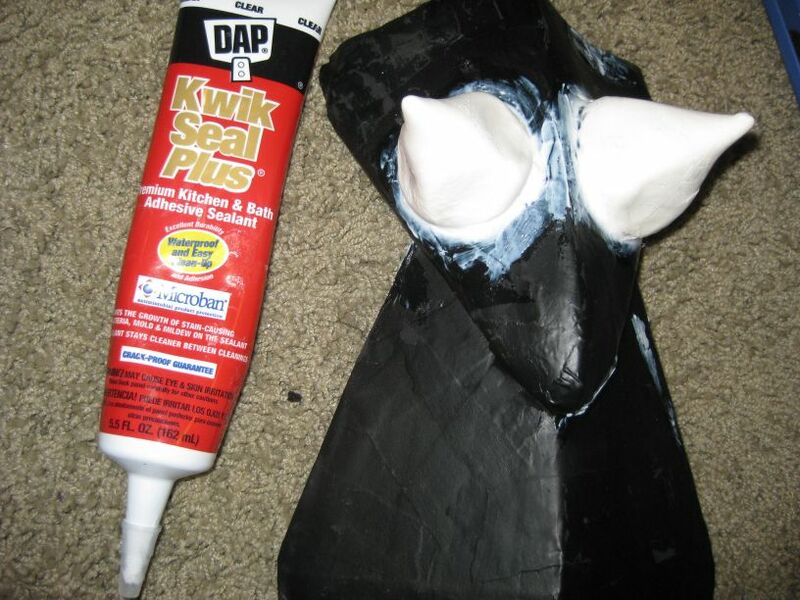 Then I used this tube of Kwik Seal Plus that I had lying around to make the base of the spikes flow into the knee piece. That way it will look more like the spikes are coming out of the knee guard rather than having a gap. Hot knife time! 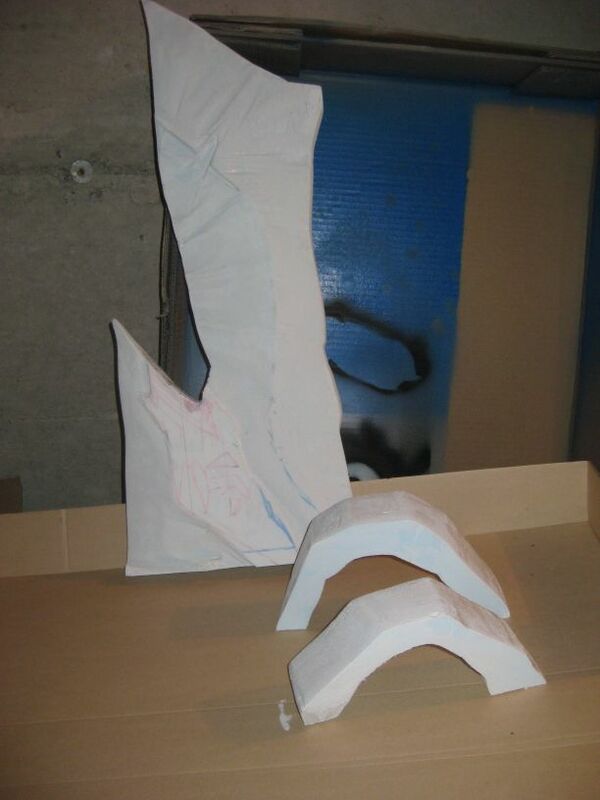 Tonight I also cut and primed the sword and pieces for the left shoulder armor. 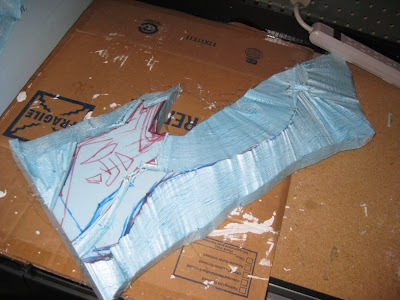 I got started on the broken sword, drawing it straight onto a scrap of insulation foam and then cutting it out with the hot knife. I had my laptop handy for reference pictures. 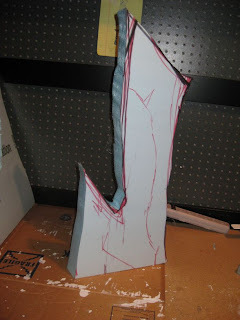 The first step was to cut out the rough shape. 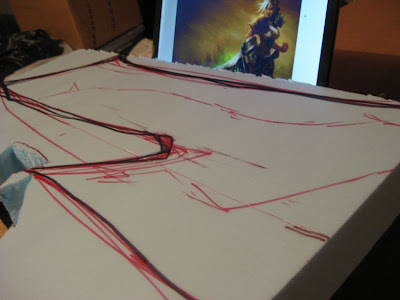 Then I drew lines for the next cuts - diagonal cuts to shape the edges. Here's what it looks like after the first round of shaping the edges - really rough. Nothing a little sandpaper can't fix though! Sanded and ready for primer! Yes, I still have some leftover even after all of the furniture I refinished and the [Staff of Infinite Mysteries] I made this year. 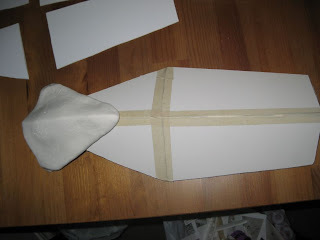 Remember, I am making this entire costume for a $0.00 budget and just reusing whatever I have! Next I cut out pieces for the left shoulder pauldron. I just estimated the shape and drew it onto the foam, then cut it out roughly. This undergoes the same process as the sword - draw, cut, shape, sand, prime... and paint later. Sanding smoothes the edges of the foam a lot. I used a rough grit first, then a finer sandpaper. 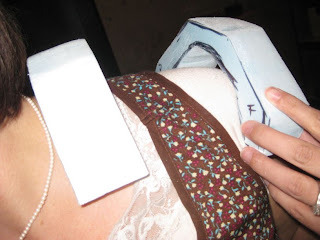 After making both pieces I tried them out on my shoulder to test the fit. Good enough, IMO! Then I had to let the primer dry on everything so I played a round of Summoner's Rift in League of Legends. For some reason I ended up playing Soraka, who I never play, but we won anyway. The other team quickly surrendered. When the primer was fairly dry, I hotglued the spikes onto the shoulder armor pieces, then added the Kwik Seal Plus around the bases to cover over most of the gap. 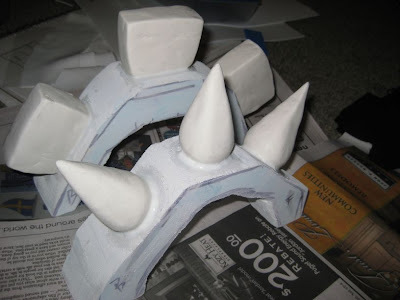 I think the blocks look better than the spikes, but I could add something more to it later. This needs to dry overnight. Last of all I slapped on a first layer of paint on the sword blade really quick, just some black and grey with metallic silver mixed in. I will detail it later after it dries overnight. 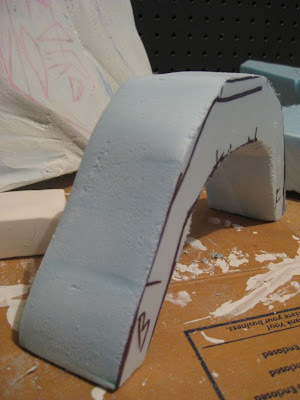 I haven't had problems with this blue foam breaking, but it's really thick, and so far I have only used it for these items and also the top of the staff for my Warcraft costume. I think you need to keep it at least an inch thick in any stressed place. And remember these are props, not meant to be swung around. It wouldn't hurt much if you hit someone, but the sword would probably break! Usually comes in Pink or Blue and is super big - I had a guy cut it in half so I could fit it in my car. What did you use for the hot knife? 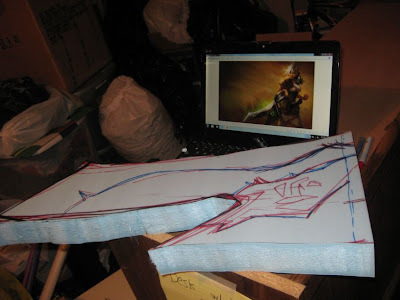 I was thinking of using a box cutter to cut the foam but I'm wondering if your way is better.